For understanding biblical Greek in context, the importance of the discoveries of papyri was recognized early in the twentieth century, while inscriptions by comparison were left unexplored. Those scholars who had intended to turn their attention to the inscriptions were delayed by their work on the papyri and by the conviction that the greater results would come from these. As a result, undue focus has been placed on papyri, and biblical Greek words have been viewed only through their lens, leading to the inference that the Greek is specifically Egyptian and vernacular. This volume widens the focus on Septuagint words by demonstrating how the inscriptions, coming from a broader geographical region than papyri and containing a wider range of registers, are a source that should not remain untouched. This work explains the current state of the study of Septuagint vocabulary and outlines the competing roles of papyri and inscriptions in its interpretation, including the limitations of focussing solely on papyri. The practical issues for a biblical scholar in dealing with inscriptions are presented and some guidance is given for those wishing to explore the resources further. Finally, examples are drawn together of how inscriptions can illuminate our understanding of Septuagint vocabulary, and thereby inform the socio-historical position of the Septuagint. The origins of apparently new words in the Septuagint, the semantic and grammatical function of words, and the geographical distribution and register all demonstrate the need for further investigation into this field. In recent decades, countries that house remains of the ancient world have become determined to keep archaeological finds within their borders. Partly as a result, many smaller archaeological museums at religious-affiliated schools across the United States, lacking the financial resources to buy works or borrow actively from other collections, are scrambling to increase the museums’ appeal. “Today they are often filling those museums with information, rather than with objects,” said Aaron Brody, director of the Badè Museum at the Pacific School of Religion in Berkeley, Calif. In the process, they have become largely “legacy museums,” he said. For the Tel Zayit Abcedary see here and links. The Siegfried H. Horn Museum has also been mentioned here, although the links have now rotted. ASKING THE IMPORTANT QUESTIONS: Who wrote the Torah? For thousands of years people believed that the five books of the Pentateuch were written by Moses. But it couldn't have been, academics say. (Elon Gilad). As usual with Haaretz, read this quickly before it goes behind the paywall. The answer in this article describes the classical Documentary Hypothesis pretty well, although (1) the second creation story in Genesis uses the divine name YHWH Elohim, not just YHWH, and (2) the idea that the name of the writer of Deuteronomy was Shaphan (cf. 2 Kings 22:8-14) assumes that Deuteronomy was composed during Josiah's reign, whereas many specialists think that what was found in the Temple was an older document (old even in Josiah's time) which eventually served as the basis for our current book of Deuteronomy. In any case, specialists in Pentateuchal source criticism now tend to have some significant reservations about much of the classical Documentary Hypothesis. I have said more on the current state of this question here. But, yes, everyone agrees that the Pentateuch was written long after the time of Moses, if there was a Moses. ASKING THE IMPORTANT QUESTIONS: Is Obama a modern-day Quintus Fabius Maximus? (Brian Michael Jenkins, Los Angeles Times). President Obama has been repeatedly accused of delay. Critics say he dragged his feet on sending more troops to Afghanistan, on addressing the dangers in Libya, on providing support to Syria's rebels and, most recently, on initiating military action against Islamic State. But is that necessarily such a bad thing? Calculated delay has a long history as an effective military strategy, dating back at least to the Second Punic War in the 3rd century BC. Although America is constantly compared to ancient Rome, this is the first time I can remember the comparison being to Rome during the Punic Wars. To launch the second Punic War (218–201BC), Carthaginian general Hannibal took an army of about 30,000 men and 37 elephants across the Pyrenees and Alps into Italy to fight the Romans. One elephant survived – apparently named Surus, meaning “the Syrian”. Hannibal often rode it. Carthage, on the coast of modern Tunisia, fell to the Romans in 146BC. They massacred 200,000 people and sold the remaining 50,000 as slaves. More, recently, on the Punic Wars is here. Cross-file under "Punic Watch." ASKING THE IMPORTANT QUESTIONS: Who is Ignazio Perrucci? (Anthony Le Donne). ARASH ZEINI: A note on the Schøyen copper scroll. This is a bibliographic note that leads to an article by Étienne de la Vaissière. The scroll itself is a Buddhist donation inscription written in Sanskrit and "Brahmī." 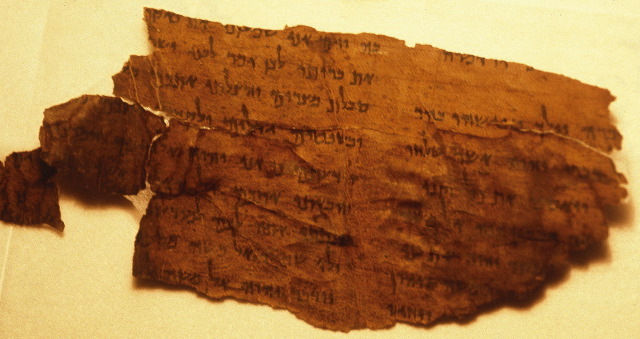 For the Qumran Copper Scroll (and facsimiles of it), see here and links. Inscriptions on metal are rare, but not unknown in the ancient world. Other examples are the gold cuneiform tablet and the gold tablets in Phoenician and Etruscan. A legendary example is mentioned in the Treatise of the Vessels. And the fake metal codices are an infamous and now thoroughly debunked fake example, but some genuine ancient lead inscriptions are noted here, here, and links. INCLUDING THE "WIDOW'S MITE": Small Change: The Tiniest Ancient Coins (Mike Markowitz, CoinWeek). In the local coinage of first century Judea, the smallest denomination was a bronze coin called a lepton in Greek and a half prutah in Hebrew. NEWS FLASH: WATCH: 2,000-year-old inscription dedicated to Roman emperor unveiled in Jerusalem. Israel Antiquities Authority: This is among the most important Latin inscriptions ever discovered in Jerusalem. (Jerusalem Post). Ecker, a Ph.D candidate, said the inscription was dedicated by Legio X Fretensis to the emperor Hadrian in the year 129/130 CE. “The fragment of the inscription revealed by the IAA archaeologists is none other than the right half of a complete inscription, the other part of which was discovered nearby in the late nineteenth century, and was published by the pre-eminent French archaeologist Charles Clermont-Ganneau,” he said. Hidden for more than 90 years beneath the rolling sand dunes of Guadalupe, California, an enormous, plaster sphinx from the 1923 blockbuster movie "The Ten Commandments" has been rediscovered and is now above ground. MODERN ARAMAIC WATCH: First Arameam Gets Registered in Israel (Arutz Sheva). Background here and links. And on a far less serious note: The Simpsons Halloween Special: Homer and Co Haunted? Where to Watch 'Treehouse of Horror' Online (Ruchinka Upadhyaya, International Business Times; my bold-font emphasis). The animated comedy's 25th annual Halloween instalment, contains a segment that parodies The Others, in which the Simpsons are haunted by another ghostly family living in the house. These ghosts turn out to be none other than their crudely drawn former selves. The Simpsons, originally surfaced in 1987 as a series of animated shorts on [Tracey] Ullman's sketch comedy show. And the second segment shows Bart and Lisa being transported to a demon-filled alternate universe after Bart reads a set of Aramaic symbols he finds on the underside of his desk. NEW JOURNAL: The Journal of the Jesus Movement in its Jewish Setting. IN SAN DIEGO NEXT MONTH: Bibliobloggers’ Gatherings at SBL/AAR (James McGrath). Planning is in progress. I'm not sure what else I have going on that Saturday evening, but I may see you there. Fortress also has a bloggers' roundtable on the Monday. Follow the link for both. I was around Cross quite a bit for five years in the 1980s and I never heard him mention this particular saying. I do know that there is a Jewish tradition or saying that Hebrew is the language of heaven, but I don't have a specific reference. It does seem to be implied in the Talmud in b. Shabbat 12a, which advises making intercession for a sick person in Hebrew, because angels don't know Aramaic. EXCAVATION: Ancient Cult Complex Discovered in Israel (Owen Jarus, Livescience). The archaeologists said they aren't sure who was worshipped at the complex, though Baal, the Canaanite storm god, is a possibility. "The letters of Ugarit [an ancient site in modern-day Syria] suggest that of the Canaanite pantheon, Baal, the Canaanite storm god, would have been the most likely candidate," Itzhaq Shai, a professor at Ariel University who is directing a research project at Tel Burna, told Live Science in an email. The goddess Anat is also in the running. This is an exciting discovery and I hope it does turn out to be a major sanctuary. But I'll believe it's a Baal sanctuary when they find an inscription that says "House of Baal" or the like. Or better yet, another copy of the Ugaritic Baal epic. JACK COLLINS: Addendum - to his excellent review of the Noah movie, noted here. So there's precedent after all for the idea of watchers made of stone. More on Noah here and links. BRITISH NEW TESTAMENT CONFERENCE 2014 PLENARY LECTURE: Simon Gathercole on the canonical and non-canonical Gospels. Summarized by Steve Walton. I was there too and I thought it was an impressive lecture. Contributors to The Divine Courtroom in Comparative Perspective treat one of the most pervasive religious metaphors, that of the divine courtroom, in both its historical and thematic senses. In order to shed light on the various manifestations of the divine courtroom, this volume consists of essays by scholars of the ancient Near East, Hebrew Bible, Second Temple Judaism, early Christianity, Talmud, Islam, medieval Judaism, and classical Greek literature. Contributions to the volume primarily center upon three related facets of the divine courtroom: the role of the divine courtroom in the earthly legal system; the divine courtroom as the site of historical justice; and the divine courtroom as the venue in which God is called to answer for his own unjust acts. In Eating in Isaiah Andrew Abernethy employs a sequential-synchronic approach to explore the role of eating in the structure and message of the book of Isaiah. By focusing on 'scaffolding' chapters (Isaiah 1; 36–37; 55; 65-66), avenues open for exploring how eating operates within the major sections of Isaiah and how the motif enhances the book's coherence. Furthermore, occurrences of eating in Isaiah create networks of association that grant perspective on significant topics in the book's message, such as Zion, YHWH’s kingship, and YHWH's servants. Amidst growing scholarly interest in food and drink within biblical literature, Eating in Isaiah demonstrates how eating can operate at a literary level within a prophetic book. The study sheds fresh light on aspects of the lawsuit motif in John from the background of Diaspora-Jewish and Greco-Roman data and perspectives. – John’s narrative of the attempts on Jesus for such crimes as breaking the Sabbath, blasphemy, and seduction are illuminated from Philo’s perspectives on vigilante execution. – Furthermore, John’s narrative of the official Jewish and Roman forensic procedures against Jesus can also be situated within the framework of the Greco-Roman administration exemplified by the legal papyri from the Roman Egypt. – Philo’s expectation of an eschatological emperor, who shall rule over many nations, provides a cultural context for the way John’s gospel re-inscribed Jesus as the true “Emperor” of all the nations.